West Waterford man Power closed with a two under 69 to finish tied for eighth on seven under at The Club at Irish Creek in North Carolina where 22 players qualified on four under or better. Ballymena man Devlin, who gave up part of his college scholarship to help Graeme McDowell kickstart his career at the University of Alabama Birmingham, signed off with an immaculate, five under 67 at Stonebridge Ranch Country Club in Texas to qualify with only a shot to spare on three under. Starting on the back nine, the 2008 US Open qualifier birdied the 16th, 17th and 18th to scorch up the leaderboard before picking up vital birdies on the par third and seventh on the way home. Waterville favourite Murphy did not fare so well at the same venue as a one over par 73 left him four shots outside the magiv number on two over. It was a similarly disappointing day for former professional footballer Stephen Grant after a two over 74 left him six shots outside the qualifying mark on level par at Grasslands Golf & Country Club in Florida. Former PGA Tour player Keith Nolan will complete his bid at The Auburn University Club in Alabama on Saturday but looks unlikely to make it after a third round 72 left him six strokes outside the top 19 and ties who will go through to next month’s second stage. Ulsterman Fergal Rafferty begins his bid at Lantana Golf Club in Texas next Tuesday. Mark Murphy is looking for his big break.Mark Murphy, Chris Devlin and Seamus Power made a positive start to their bids to come through the gruelling Q-School and earn places on the megabucks PGA Tour. 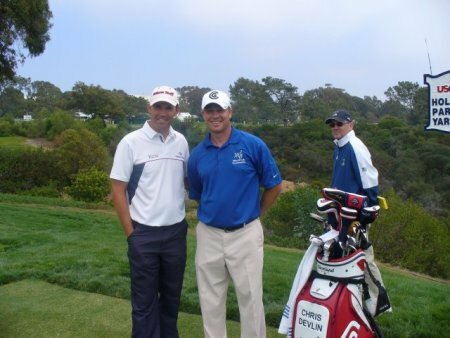 Who’s that practising with Chris Devlin during the 2008 US Open at Torrey Pines?Ballymena’s Chris Devlin and Waterford’s Seamus Power are the only Irish players inside the qualifying positions at the first stage of the PGA Tour Q-School. Seamus Power has been in good form this season, winning twice on the eGolf Professional Tour.West Waterford’s Seamus Power and Waterville’s Mark Murphy made postive starts in their bids for PGA Tour cards at the first stage of the Qualifying School. Seamus Power made it through to the second stage of the PGA Tour Q-School with nothing to spare. 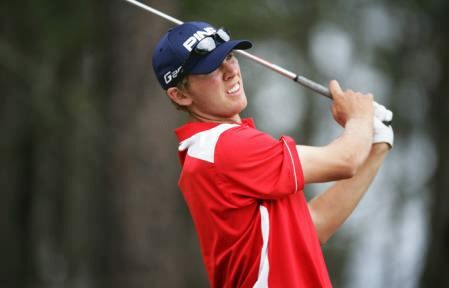 Picture courtesy eGolfProfessionalTour.comSeamus Power birdied his penultimate hole to keep his PGA Tour dream alive by a whisker at the first stage of the Q-School in North Carolina.